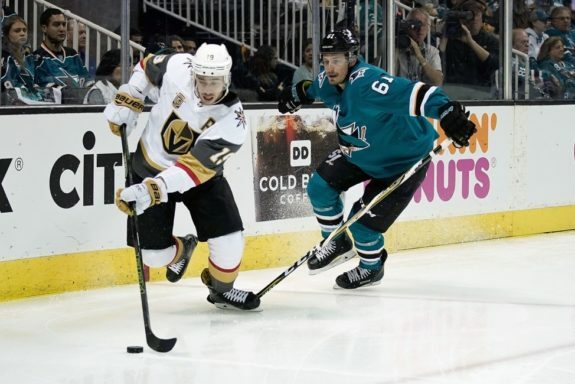 Fans of the Vegas Golden Knights are comfortable viewers of Stanley Cup playoff hockey, and many are familiar with their upcoming opponent, the San Jose Sharks. For those who aren’t or want a deeper dive, The Hockey Writers is here to help. We’ll go over the roster, give you a feel for the team and players, and cover some of the special situations. 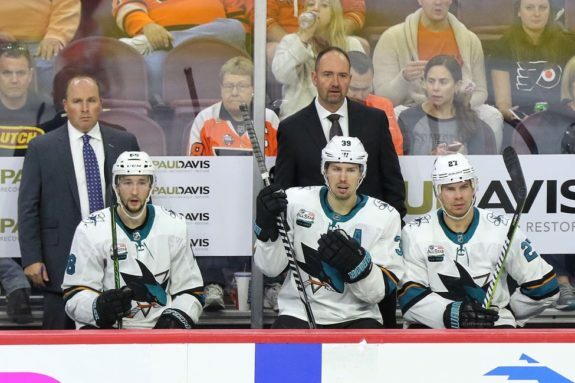 Under fourth-year head coach Peter DeBoer, the Sharks became an offensively-oriented team for the first time in his tenure. Still, how tight they play defensively has a lot to do with whether they win or not. The team finished the season 32-0-0 when giving up two or fewer goals. In the offensive zone, the team is driven by power forwards and a pair of elite offensive defensemen. The Sharks enter the playoffs with injury risks. 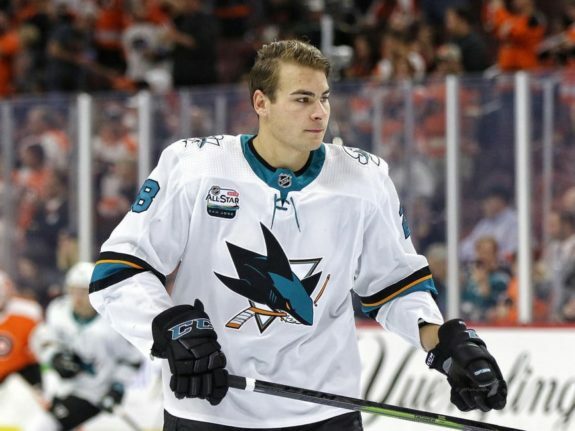 While no team is fully healthy, two Sharks players are critical to the team’s prospects, Timo Meier and Erik Karlsson. Both are expected to play, but how healthy they are is an open question. 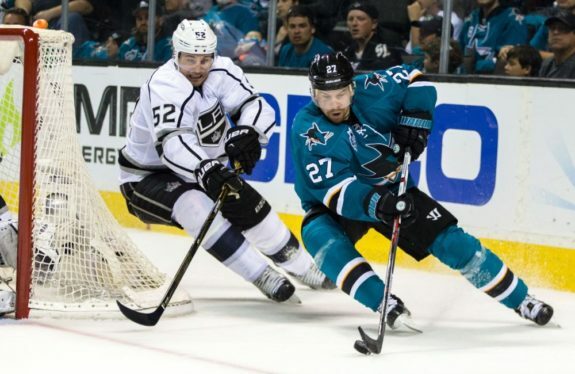 The Sharks are a deep team, giving them a chance to win with secondary players. Nine players tallied over 50 points this season, 12 tallied double digit goals, four of those netted 30 or more scores. 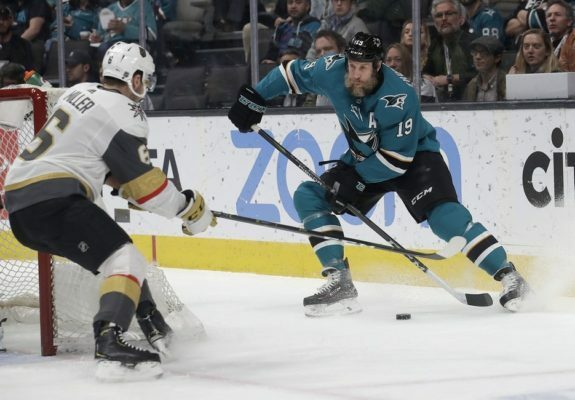 The Sharks’ poor play late in the season coupled with the Golden Knights’ dominance over San Jose the past two seasons makes the Sharks an underdog in the series. 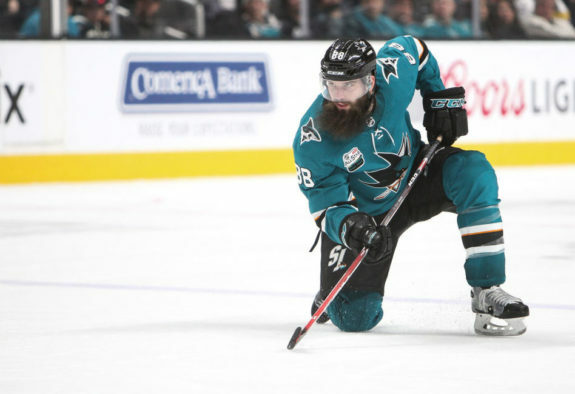 In an earlier piece, I covered what the Sharks need to do to win games and the four keys I identified remain on point. Offensively, go behind the net. Get good goaltending from Martin Jones. Limit opponents quick-strike scores, with extra vigilance to avoid allowing odd-man rushes. And leverage a potentially lethal the power play by drawing penalties and scoring on the opportunities. 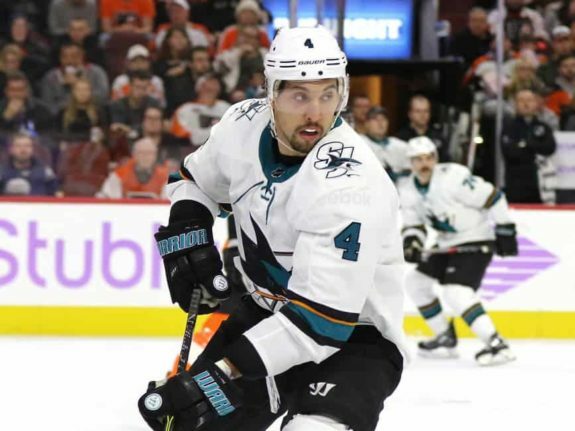 More recently, I discussed how the Sharks should prepare for their series against Vegas, with some similar points and some new ones. If the Sharks do these things, they’ll have a very good chance to win the series. Two players to watch carefully are Erik Karlsson and Tomas Hertl. Karlsson can create all kinds of offense from his defensive position while Hertl is the one player Vegas has simply been unable to handle. It’ll also be interesting to see if Evander Kane and Timo Meier take a cue from Hertl and play behind the net. In the six-game playoff series last season, all but one even-strength Sharks goal came as a result of play behind the net. The Sharks are backstopped by goalie Martin Jones (jersey number 31). Barring injury, you can expect to see Jones play every minute of every tight game. It has been a down season for Jones. His save percentage (SV%) on the season is .896, by far a career worst. Early in the season, he struggled behind a porous Sharks defense which allowed numerous odd-man rushes. The Sharks have tightened things up a good bit, at least until recently, and there are times Jones has looked good. But for the Sharks to have a real chance in the series, Jones needs to play better than he has all season. Jones has been good in the playoffs, entering this year with a .926 SV% over his career. In 2015-16, the season Jones backstopped San Jose to the Stanley Cup Final. Backup Aaron Dell (30) also had a down season, though its unlikely he sees meaningful action. Dell posted a .886 SV%, and sadly, it is a reflection of his play over the course of the season. It is worth noting, teams play more confidently when they trust their goalie. Though they say the opposite, this season, the Sharks have no special reason to trust theirs. San Jose throws challenging defenders at opponents. The pairings are up in the air at the moment and there is a chance for DeBoer to make a major change. Four defensemen will definitely play: Brent Burns (88), Marc-Edouard Vlasic (44), Erik Karlsson (65) and Brenden Dillon (4). This leaves three defensemen, Justin Braun (61), Joakim Ryan (47) and Tim Heed (72). DeBoer will select two to play. Burns (16G, 67A, plus-13) is a Norris Trophy candidate and the league’s top scoring defenseman. His best available partner is Ryan (0G, 7A, minus-1). Radim Simek was the best partner, but he is out for the season. Dillon (1G, 21A, plus-19) has been excellent when paired with Karlsson (3G, 42A, plus-6). The best partner for Vlasic (3G, 22A, minus-6) has been Tim Heed (2G, 11A, plus-9). Alas, this leaves veteran Braun (2G, 14A, minus-14) out of the lineup and I doubt, DeBoer will leave Braun out of the line-up, though I think it’d be the right move. DeBoer may bench Ryan (a frequent occupant of the coach’s doghouse) in favor of Braun, the team’s lowest plus-minus player. This means he’ll go with four right-handed defensemen along with lefties Vlasic and Dillon If DeBoer goes this way, it’ll be an approach he didn’t use in the regular season. As of now, it appears he’ll bench Heed, though it’d be an odd choice, given Heed has played very well in the second half of the season. I won’t be surprised if the pairings change during the course of the series, even within the game. I expect a Karlsson-Dillon pairing. They were exceptional together for the six weeks they were partnered. Vlasic should be paired with Heed, but it appears he’ll be paired with Burns while Ryan will go with Braun. I’m not sold this will hold for the series and it certainly isn’t optimal based on what we’ve seen this season. Vlasic is known as an elite defenseman, but it hasn’t been the case most of the season, his first ‘minus’ season in over a decade. Vlasic is often thought of as a player who plays well with others, but again, not this season. His partnerships with Karlsson, Burns and Braun have all been poor. Vlasic surprisingly, found success in playing with Heed. Heed, a former forward, is small and agile, with a big shot. Heed’s defensive work isn’t great, but his chemistry with Vlasic is real. Vlasic went from minus-18 to minus-six, mostly while playing with Heed. Assuming he plays (and he should), the 28-year-old will make his NHL playoff debut. Braun has had a tough season. He’s been beat regularly and in most every way imaginable. He peaked at plus-six on Nov. 1 and has been minus-20 since. If there is one area which might be redeeming, he has actually been a good partner with Burns, albeit in limited minutes. Ryan lost his starting job opposite Burns to Simek. Simek played very well, but torn knee ligaments have him out for the playoffs. Ryan is a smooth skater and good puck handler, but can be physically overwhelmed (Alex Tuch did this to Ryan on a power play goal in last season’s playoffs). In the past, he complimented Burns well. But Ryan’s uneasy relationship with the coach has hurt the player. Ryan plays like he needs to avoid any mistakes, which is not how a player succeeds. Burns is a tour-de-force. He led the league in points by a defenseman and his plus-13 rating is indicative of a player who did a lot of things right. He’ll still make plenty of mistakes, but his athleticism is second to none and the amount of ice he covers is enormous. His wrist shot from the point is the best in hockey, though overrated as a weapon. It is his ability to mix things up by shooting for tips and deflections which makes him a threat. A big risk with his point shot is getting it blocked and turning into an odd-man rush the other way. Burns is incredibly dangerous when he goes from defenseman to power forward, something he can do in the blink of an eye and I expect he’ll do often in the series. He is good on the power play and surprisingly good on the penalty kill. Erik Karlsson, specifically his health, is the big unknown. The coach says he is ready but the coach isn’t always right. While Burns is going to be a Norris finalist, Karlsson might actually be the team’s best defenseman. For a quarter of the season, beginning in early December, he was probably the best player in the league. His numbers reflect the totality of his season, including a rocky start and injury issues since just before the All-Star break. But at his best, he changes everything. He played, albeit cautiously, in the Sharks season finale. Questions abound: Is he really fully healthy? How rusty is he? Can he hold up? Will he still have chemistry with Dillon? Another set of questions surround Karlsson and his potential to reach free agency. 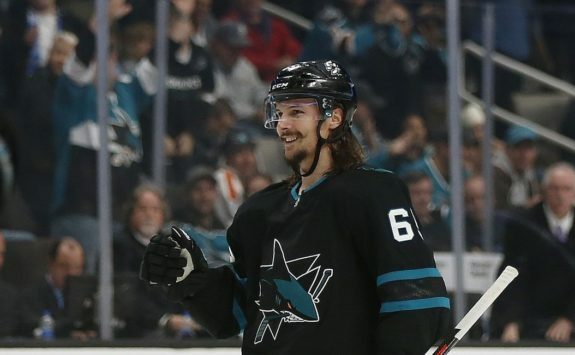 Karlsson hasn’t re-signed in San Jose, though he’s been eligible to do so since late February for an eight-season deal (and a seven-season deal before then). He can become a free agent in July. A big payday awaits, but could the contract situation impact his play? Or might it serve as a distraction? Dillon is a big and physical player. He had an excellent regular season, really a breakthrough season. He was partnered with Karlsson when Karlsson took off. There is little doubt he should partner with Karlsson if the latter is healthy, they were the league’s best pairing. He’s paired well with others, too. Dillon’s skating has improved enormously over the past few seasons (the word pylon was used in years past, but no longer), his passing and positioning have improved as well. He leads the Sharks in plus/minus and while he’s clearly not their best defenseman, the result is not a fluke. The Sharks are a power-forward driven team, with Hertl, Evander Kane and Meier all getting to 30 goals this season. The Sharks have plenty of skill in the top nine forwards and perhaps a solid fourth line as well. The Sharks top power forwards are tough to handle and one in particular, has given other teams fits. Including Vegas. Before getting to the line combinations and players, I’ll point to two goals in the most recent game between the two teams. One is Hertl being Hertl, scattering defenders like a tsunami, eventually leading to an easy goal for Kane. On the second goal, Meier throws off a defender behind the net, and the puck eventually gets to Hertl in front who scores. This approach is what the Sharks can bring, shift after shift, if they choose. It is their path to success. The Sharks must use their power players and emphasize playing behind the net. Vegas provides a tough defensive matchup, but if the Sharks are relentless in going behind the net, they can win. If they chose not to go back there, the odds will favor Vegas. The forward lines are not completely set at this point, but there is only modest juggling to do. The Sharks’ top line appears to be Joe Pavelski (8), Meier (28) and Logan Couture (39). It has been hard to get a read on this trio. 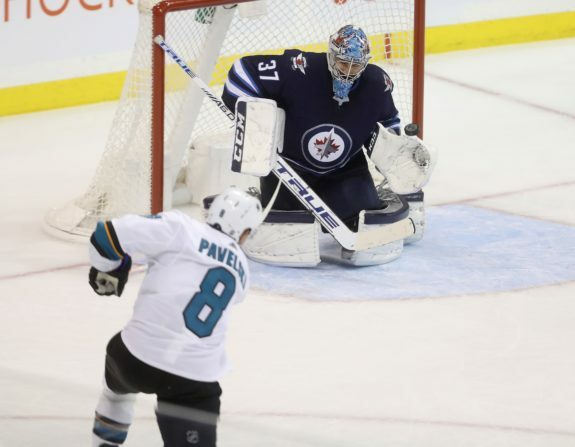 Pavelski (38G, 26A, minus-4) was out recently, Couture (27G, 43A, minus-6) has been sick and Meier (30G, 36A, plus-9) missed the season finale. If all players are healthy come the playoffs, this line has enormous firepower. The powerfully built Meier is the wild card here. He is just 22, whether he is ready to take the next step as a playoff performer is the question. He has the talent and tenacity. He’s also strong as a bull. On this line, he is the guy San Jose needs to go behind the net. 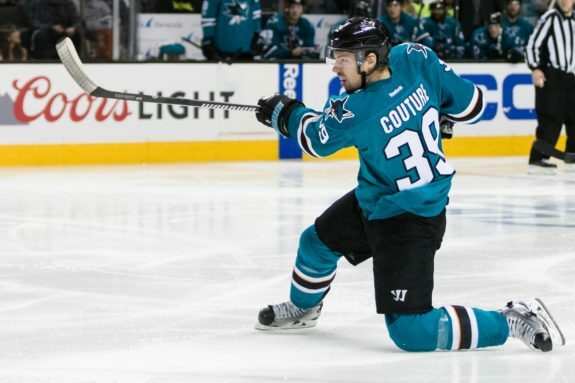 Couture looked exhausted at times down the stretch, just 11 points and a minus-eight over the final 16 games. The Sharks have had success pairing Hertl (48) with Kane (9). The duo, both power forwards, has been excellent. Hertl (35G, 39A, plus-5) is a handful. 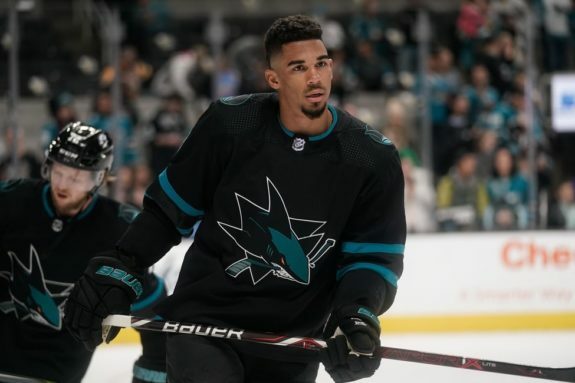 He was the one player Vegas had trouble handling last season, and he was the best player on the ice (by a bunch) for either team in the Sharks 4-3 overtime win on March 30. Kane (30G, 26A, minus-4) is the most dynamic player and spends too much time in the penalty box. The third member of the line is up in the air. I think it’ll be Gustav Nyquist (14), though Joonas Donskoi (27) has been effective with the group. Nyquist (6G, 5A, plus-1 in 19 games as a Shark ) came from the Detroit Red Wings at the trade deadline and the results have been mixed. He has a goal-scoring touch (22 for the season), but doesn’t win a lot of battles and still seems to get lost on the ice too often. Donskoi (14G, 23A, plus-10) is a good passer and complimentary player. He also hasn’t scored a goal since the team’s Jan. 10 win over Vegas, which has led to suggestions he hasn’t been playing well. Bad luck, modest ice time and no power play time are bigger culprits in the slump. 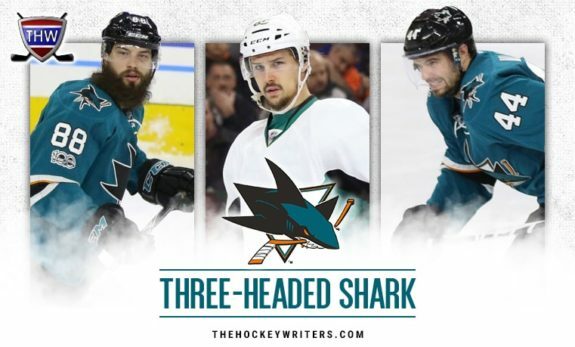 The Sharks’ third line is clear. Joe Thornton (19) centers Kevin Labanc (62) and Marcus Sorensen (20). Labanc put up career numbers (17G, 39A, minus-1). Though his defensive game has improved from last season, it is still lacking. At least it is no longer a shock when he wins a puck battle. Sorensen (17G, 13A, plus-10) is small, very quick and surprisingly physical. Though he had respectable numbers this season, it felt like he probably deserved better. He can be a thorn in the side of opposing teams. Thornton (16G, 35A, plus-8) had a difficult start to the season, likely related to recovering from knee surgery. But in the last couple months, he’s turned back the clock a good bit. The future Hall-of-Famer isn’t the top line center of years past, but in a third line role, he’s a nightmare for other teams. There is also an inspirational aspect to Thornton. He is running out of years and while he sits with legends on a variety of NHL all-time lists, he lacks a Stanley Cup. No doubt, his teammates are anxious to change this. The more it feels like this might be the year, the more intense this factor becomes. The rest of the Sharks forwards will comprise the fourth line and bench. Barclay Goodrow (23) centers the line, though the wingers are not clear. Melker Karlsson (68), Lukas Radil (52), puncher Micheal Haley (18) or youngster Dylan Gambrell (7) are the candidates. As of now, I’d expect Karlsson (12G, 4A, minus-1) and the previously discussed Donskoi to be the wingers. Like Goodrow (7G, 9A, plus-4), Karlsson is an effective penalty killer. Radil (7G, 4a, plus-7) is an effective player as well, it wouldn’t surprise me to see him out there. Both Goodrow and Radil fit the power forward mold, which is so critical the Sharks. If DeBoer goes with the tough but ineffective Haley, it is a win for the Golden Knights. The Sharks’ power play is less of a weapon than it might be. The team doesn’t draw enough penalties and their conversion rate has been below the level their firepower indicates. Erik Karlsson, Burns, Thornton, Pavelski, Couture, Hertl, Kane, Meier, and Nyquist is just a ridiculous amount of firepower. Add in Labanc, who thrives in more open ice, and San Jose can roll two units, both incredibly dangerous. During the regular season, the power play underachieved. In part, the injury to Karlsson played a role, but the units often looked out of synch. If they do get in synch, this can change everything. Winning more face-offs to start the power play would be very helpful. Better offensive zone entries would also make a difference. The Sharks’ penalty kill was terrific for a good chunk of the season, then faded badly in the latter parts. The Sharks do not take a lot of penalties, but they’ve been less disciplined recently and it has been costly. This is a case of ‘returning to form’, not doing something they’ve never been good at. The Sharks will use many of their top players on the penalty kill, including Burns (surprisingly good), Hertl and Couture. 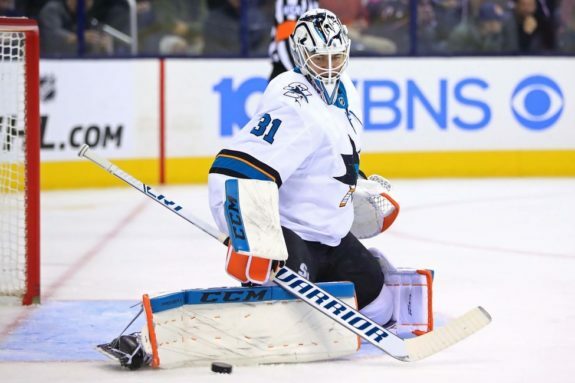 For the Sharks, it usually boils down to defense and goaltending. Neither has been consistent this season. The stat bears repeating, the Sharks are 32-0-0 when allowing two or fewer goals. They have enough offense to win games if they play a disciplined game. In their late season swoon (1-8-1 before winning the final two games), team discipline became intermittent. It was mental errors, more than physical ones, which were responsible for the downturn. Expect plenty of line and defensive pair juggling from DeBoer, with players like Donskoi and Ryan on particularly short leashes. The good news, the Sharks know how to play better than they did late in the season. They know the formula for success. Vegas is a tough foe and the record strongly favors them. The relentless pressure applied by the Golden Knights means ‘intermittent discipline’ won’t work for the Sharks. The Sharks can compete if they stay focused and return to the form they showed for major chunks of the season. We’ll see which Sharks team shows up starting on Wednesday.